Russian Government Council on Grants decided to extend megagrant for the research «Siberian Arctic shelf as a greenhouse gas source of planetary significance», conducted by the international collaboration of scientists from 14 universities and research centers from all over the world. Grant was extended for two years - 2017 and 2018. During this period, the research team of Igor Semiletov will continue their studies. The scientists are going to understand how the greenhouse gas emissions caused by degradation of underwater permafrost affect climate and environmental situation on the planet. Also, scientists are going to find ways to predict these changes. It is to be recalled that in 2014, Tomsk Polytechnic University won a multi-million grant of the Russian Science Foundation, aimed to support small groups under the guidance of leading Russian and foreign scientists. According to experts, TPU research under the supervision of Igor Semiletov «Siberian Arctic shelf as a greenhouse gas source of planetary significance» will make a significant contribution to the development of cooperation and equal collaboration between Russia and the other Arctic countries, but most importantly - it will open a new level of understanding of the Arctic climate system functioning. At the premises of Tomsk Polytechnic University an international collaboration on Arctic research was established including 14 universities and research centers of Russia, Sweden, the Netherlands, the UK and the USA. During the Arctic expeditions TPU scientists have found great subsea permafrost degradation. It turns out previously a strong ice «stopper» preventing emissions of huge gas hydrates reservoirs has «sprung a leak» and taliks have emerged in it. Through them massive gas releases go into atmosphere. Currently the scientists are keen to evaluate how much gases are buried on the extended area of the Siberian Arctic Shelf and how their remobilization could impact the sensitive Arctic climate system. 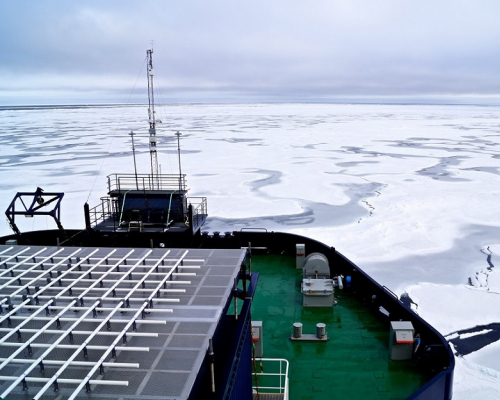 November 21-24, 2016 TPU hosted the Arctic Forum dedicated to the study of biogeochemical consequences of the permafrost degradation in the Arctic Ocean, with an emphasis on the East Siberian Shelf - the widest and shallow shelf of the World Ocean. The Arctic Forum brings together scientists from 12 universities and institutes in Russia, Sweden, the Netherlands, the UK, the USA and Italy. One of the main objectives of the forum was the planning of joint research in the framework of the international multi-year programs International Siberian Shelf Study (ISSS) and the Swedish-Russian-US Investigation of Cryosphere-Carbon-Climate Interactions in the East Siberian Arctic Ocean (SWERUS-C3). Leading world’s Arctic researchers signed a resolution to establish the International Arctic Siberian Scientific Center (IASSC). The grant size will amount to 30 million rubles. The same amount would be attracted by the University. About 80 scientists in the framework of the Swedish-Russian-American cooperation program (Swedish-Russian-US Investigation of Cryosphere-Carbon-Climate Interactions in the East Siberian Arctic Ocean (SWERUS-C3)) study the interaction between degrading cryosphere, the carbon cycle and the climate system in the northern part of the Laptev Sea, the East Siberian Sea and the Chuckchee Sea. In this collaboration Tomsk Polytechnic University is represented by Igor Semiletov, Head of the Arctic Sea's Carbon Research International Lab, and professor of the University Alaska Fairbanks, and Natalia Shakhova, Professor of the Department of Geology and Minerals Prospecting of Tomsk Polytechnic University.